Somewhere, somehow, I got it in my mind that taking a bicycle ride from Canada to Mexico would be both challenging and fun.. I'm not sure when I got this affliction, but it kept gnawing on me until last year, in the Fall of 2003, I decided to give it a try. Taking a train to Seattle, and arriving in the rain, I caught the hydrofoil ferry to Victoria, British Columbia, Canada. Having established the Canadian stage of this trip, a ferry ride took me across the Straits of Juan De Fuca to Port Angeles, Washington. It took me five days of riding and one day of waiting out a rain storm to reach Astoria, Oregon. The ride took me down the Hoods Canal and across to the coast. It was not a particularly pleasant ride, much of it through rather unpopulated and logged off countryside. The weather wasn't great either, usually overcast and with southerly winds. Wind from the south means a headwind. I wanted fair weather and a tail wind from the Northwest. 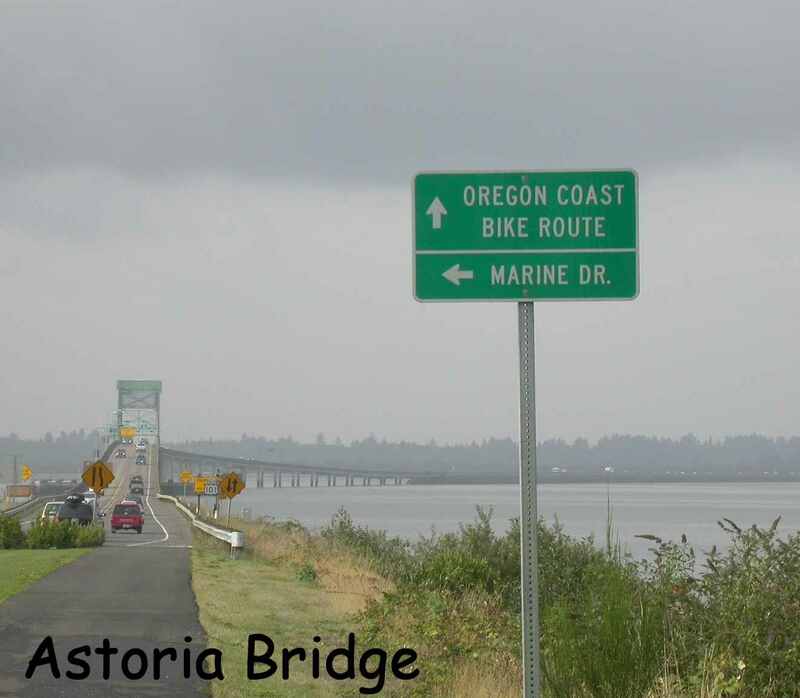 I finished my ride at Astoria, about 210 miles from Port Angeles. The combination of poor weather and unexciting country completely erased any desire to continue. But now it is a year later and I can't help but feel a bit like I failed to do something that I had set out to do. And the idea of riding to Mexico continues to nag. Being this is my sixty-fifth summer, I thought that if I ever wanted to do this, maybe I shouldn't wait too much longer. If I could say I had already done the Canada to Oregon segment, maybe I could start this year where I left off in Astoria. The Oregon coast beckoned. This is the first day of my continued trip. I didn't ride very far, only 25.40 miles (my odometer reads in hundredths of miles). Not being in top condition for such a trip like this, I wanted to start out slowly. Why I should begin a venture like this without proper conditioning is because people who would prepare and get in proper shape are wimps.......and much smarter than I. The trip was to start in Astoria, where I left off last year. I was planning on taking the Lewis and Clark Expedition Train to Astoria. This would have been interesting had the train been running. It seems that an engineer was backing a freight train near Astoria. The end of the train would have crossed a bridge that crossed a slough. Would have, that is, if the bridge had been closed. The engineer, quite embarrassed, I'm sure, backed the last few cars into the slough. Because it would take a couple days to get the track cleared, the company provided buses. Not as nice as a train, but it got me to Astoria. About 25 miles later, I was in Cannon Beach, where I spent the night at a campground. A short note about my bike. It is a Waterford, built in New York. 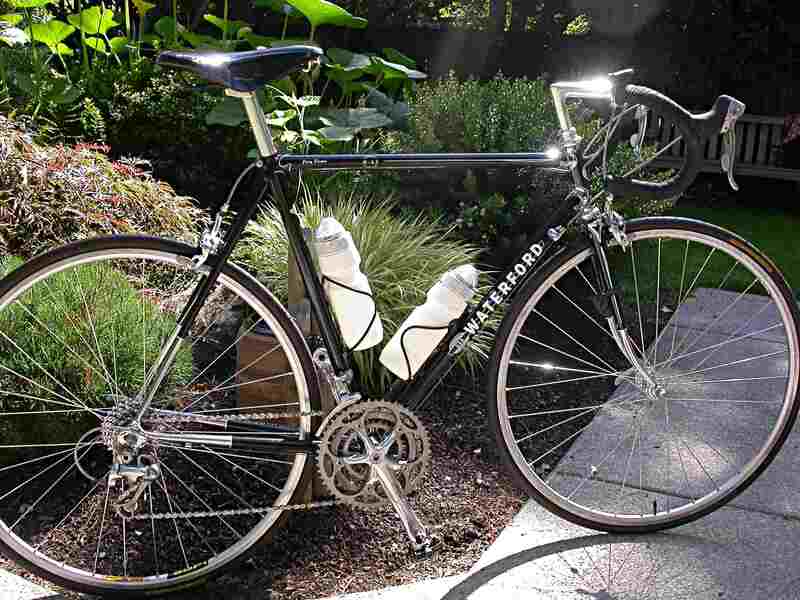 It has double-butted Reynolds 531 frame tubes, silver brazed to hand cut lugs. 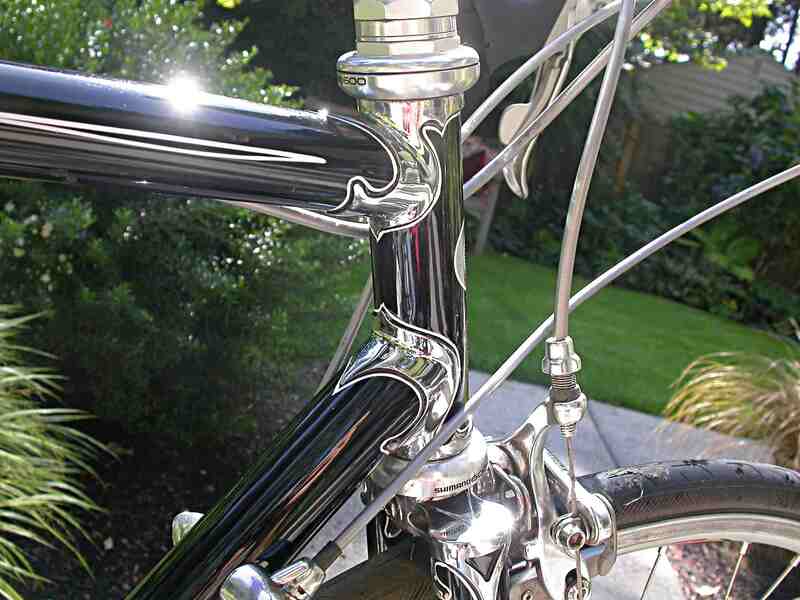 With the chromed lugs and stays, it has a classic look, one might say retro. I like it better than the more modern styles, maybe I'm a little retro myself. Yesterday was a fine day, partly sunny with temperatures in the high 60/low 70s. Toward evening, clouds began rolling in as I crawled into my small tent. Soon, it began to rain and continued to do so most of the night. The morning looked marginal, but after packing my now wet/ damp camping equipment, I headed down the road. Soon a light mist fell, quickly followed by rain, sometimes rather heavy rain. I continued until Tillamook, 43 miles from Cannon Beach, where I found a motel with a vacancy (this being the Labor day weekend). With the heat on high, I spread out and draped all my wet stuff, sleeping bag, tent, clothes, tarp, around the room to dry. Tomorrow's forecast is for partly sunny, with temps in the low 70's. Sounds very similar to today's forecast. We'll see. Beautiful day! Warm, sunny, nothing to complain about. Well, maybe the hills. Rode from Tillamook to the Lincoln City KOA, 40.68 miles. Rode from the KOA at Lincoln City to Beachside State Park, 49.02 miles. A tent site at KOA is $22, pretty high for just a spot to pitch a tent. A state park that has hiker/biker sites, and most do, charges only $4. A good deal for a tent site, table and hot showers. The trouble is the state parks are not spaced in a manner that fits my energy level on any given day. I do feel stronger each day, although the strong tailwinds may be deceiving me. Starting to develop a knee pain, but it doesn't seem to be getting any worse, so I'll just hope for the best. Today I rode from Beachside State park to Reedsport, 55.21 miles. Not all that far, but quite hard. 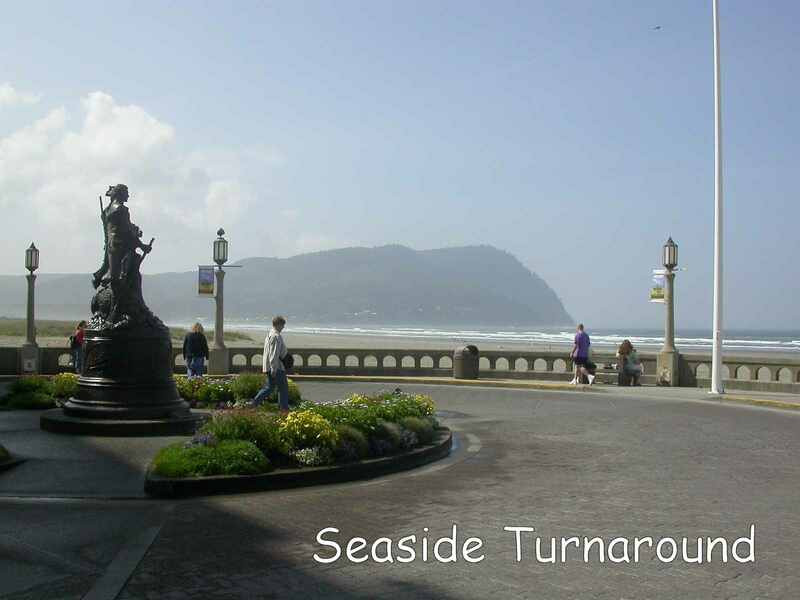 This is some of the most scenic parts of the Oregon coast, with many high viewpoints.. Seems like I spent the entire day climbing hills. Funny thing about hills. Commonsense says, indeed logic dictates, that the downhill portion must equal the uphill portion. However, after grinding slowly, painfully, uphill for an hour, only to coast down the other side in mere minutes, it's hard to keep this concept firmly in mind. 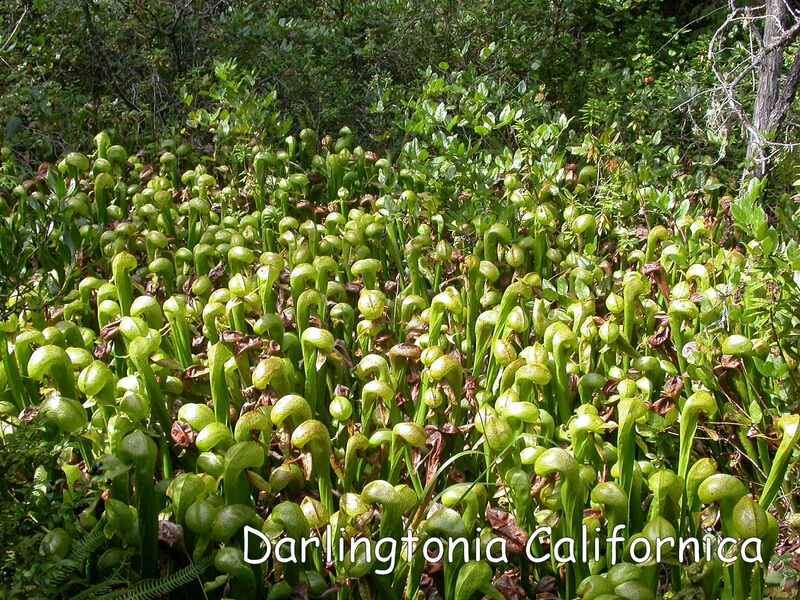 I stopped for a break, (one of many) at the Darlingtonia Botanical Wayside where, in a small marsh, grows Darlingtonia Californica. This is a unique plant for two reasons. One is that it is a carnivorous plant, catching and digesting insects in its pitcher-like leaves. The second unique thing is that, for some reason, it is the only botanical name I can remember. 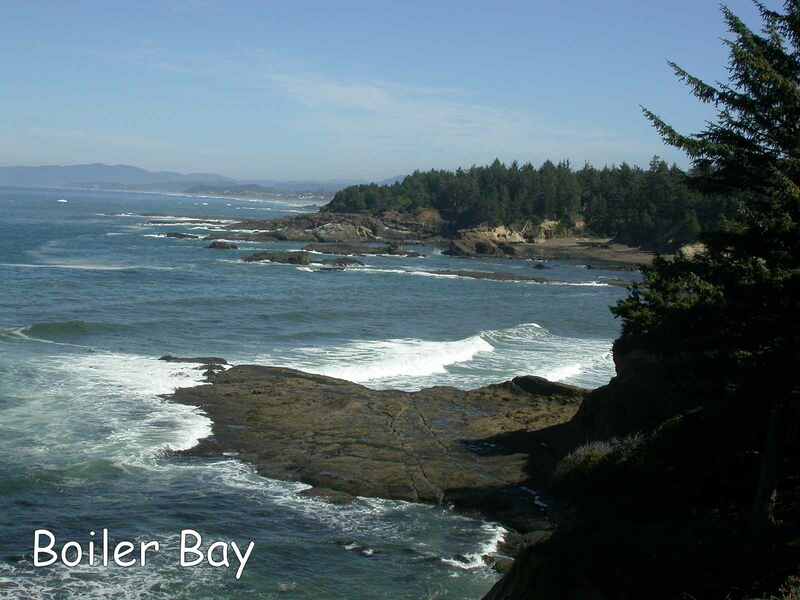 Although I had thought about maybe reaching Coos Bay today, by the time I reached Reedsport, I had had enough for the day. I found an Economy Inn (Senior rates) and checked in. A hot shower never felt better, I even shaved for no known reason. Another beautiful sunny day camped at Bullards Beach State park. I am sitting at my campsite table, reading, writing and listening to a small Grundig AM/FM/ short-wave radio. Listening to the various bands, I hear English, Spanish, German, French and some I can't identify. Sounds from far away that drift and warble in a way that is both nostalgic and mysterious. I look for music and pause briefly at some of the many religious stations, each with its own brand of theology. WWV comes in strong at 10MHz from Boulder, Colorado, giving me time checks accurate to a thousandth of a second. I rode 38.94 miles to Humbug Mountain State Park and found a hiker/biker campsite. 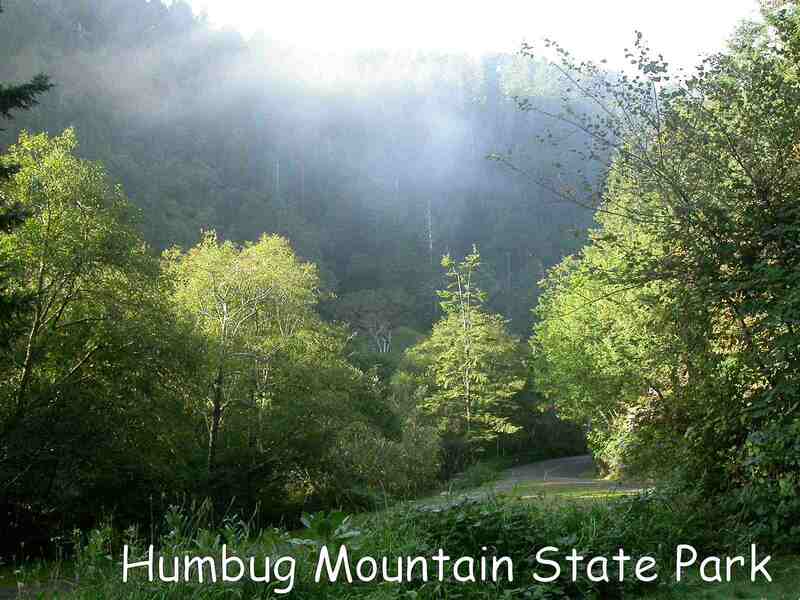 Humbug Mountain State Park is located at Latitude 42.689036N by Longitude 124.43124W, should you somehow need to know. Nothing special about the days ride;nice weather, tailwind, rather sparsely populated, boring, lonely. I have been trying to do a little birding as I ride down the coast, but haven't seen much. I had thought that the shorebirds would have started their fall migration by now. Maybe I'm too early, maybe I'm too late. While I write this I can hear the distinctive call of the Red-breasted Nuthatch off in the trees. Rode 51.32 miles to Brookings, almost to the California border. This is actually the second time I've made this trip. Many years ago, sometime in the 70's, my son and a friend made it down the Oregon coast. I don't remember how long it took us, but I'm sure it was faster than I'm going now. But, other than being a little older, I wasn't pulling a trailer. The trailer weighs 56.5 pounds, loaded with a small tent, ground tarp, Thermo-Rest sleeping pad, sleeping bag, MSR camping stove and fuel bottle, cooking pot and cup, about four days of clothes (I'm actually writing this in a Laundromat), small radio, small binoculars, digital camera, tire pump, book (only light reading, of course), cell phone and few days of freeze dried food. Crescent City, California was only 29.10 miles and I was feeling down, both physically and mentally. Maybe I need a rest. The weather the last couple of days has been threatening, cloudy and foggy, with southerly winds (read headwind). Light mist at times. From Crescent City to Elk Prairie Campground is only 34.52 miles, but they were rather hard miles. It had rained a little last night and the morning was cool and foggy. After a breakfast of McDonald's Big Platter Breakfast, I soon encountered the first of the hills that lasted all day. 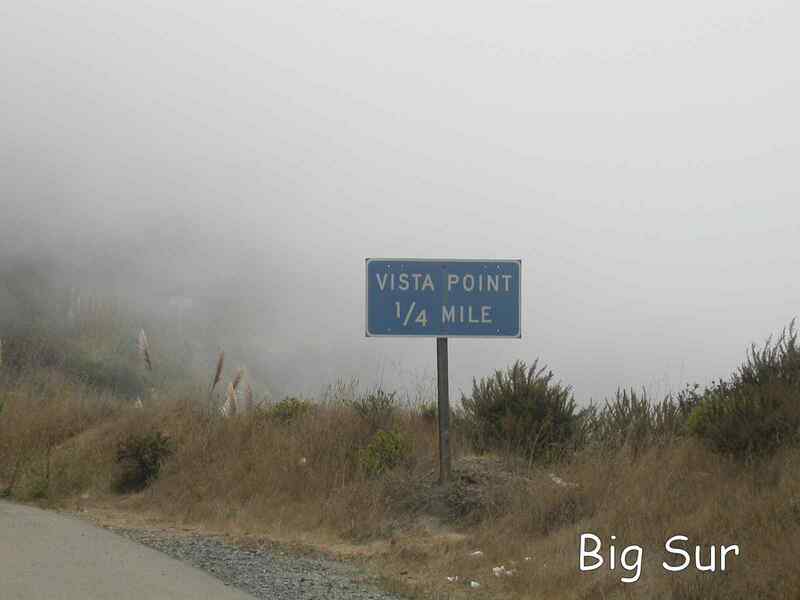 From sea level, the road climbed to 1200 feet with the promised spectacular view was nothing but fog. I kept my blinking red tail light on as the road dropped down and back up, over and over again. After becoming thoroughly drenched with sweat climbing, the short, fast descents are absolutely freezing. The short days, small mileage is getting depressing. I'd like to be making at least 50 miles per day, and I'm well under that. The roads have been hilly, the wind has been in my face for the last couple of days and the trailer is not getting any lighter. Tomorrow, I will be in Eureka. I've been pedaling for 10 days now, and I'm tempted to take a rest day. 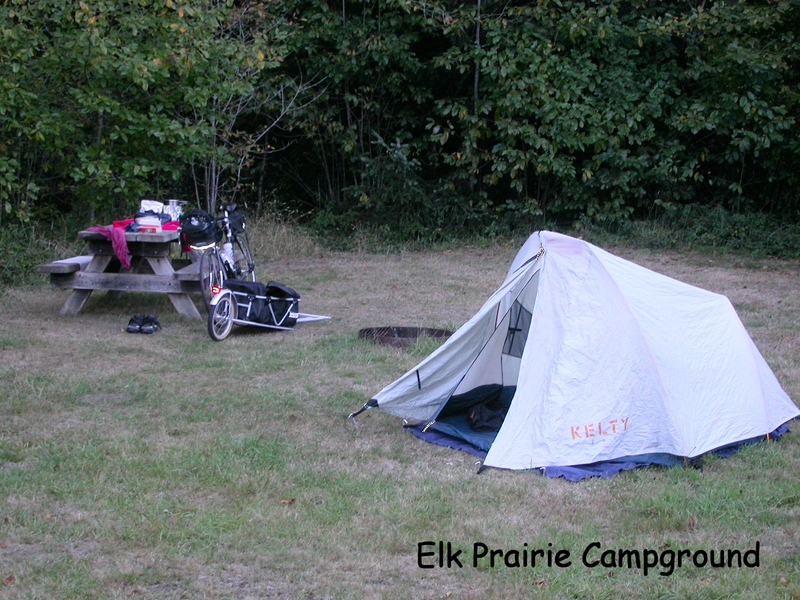 I'm staying in Elk Prairie Campground. This is a great campground with well spaced sites, some deep in the Redwoods and others out in a sun lit field, nice restrooms, deer and elk wandering about and the hiker/biker site costing only $3. After a shower and a delicious meal of freeze dry chicken and noodles, I settled into my tent to listen to the radio and read. Oddly, the best music station, in English, I could find, was being broadcast from Bangkok, Thailand. I listen for a while, then turn the radio off to listen to a couple of owls and the numerous night insects. Later, the night sky is brilliant with stars, the Milky Way a broad swath across the sky. Much to my surprise, later that night, I'm awakened by the sound of rain. It had stopped raining by morning and I packed my wet tent. A short distance down the road I pass a bicyclist walking his bike. I see he has a flat tire and I stop. He is Japanese with almost no English. I can't find out where he came from or where he is going. But I could see he had no pump and no patches so I patched his inner tube, which already had several patches. After getting him going again, I moved on, wondering what might be his story. Many people in cars and RVs pass me. I can only feel pity for these poor people speeding to wherever. They miss the satisfaction of finally cresting a long hill and the blessed dissipation of lactic acid. They are totally ignorant of the variety and quality of the road shoulders or lack thereof. They also miss the ever changing scents along the way; the smell of fresh cut wood on passing lumber trucks, the smell of the ocean, the heady aroma of various road kills, the ability to know the approach of a barnyard before actually seeing it, the scent of licorice as I pass a clump of Anise, the first smell of eucalyptus. California in noted for its' trees, most notably for the two species of Redwoods, closely followed by palm trees. To my mind, the tree that most typifies California is the Eucalyptus, the Blue Gum Eucalyptus, imported from Australia. I have heard they were first introduced as part of a land scheme, a get rich fraud. The tree, a fast grower, would be used for lumber, which at the time was being imported from the Pacific Northwest. Unfortunately, as lumber, the tree is worthless,. The wood is very crooked and splits and checks as it dries. I'm not even sure it makes good firewood. Many people consider it to be a pest, crowding out native plants and trees. It is certainly a messy tree, littering the ground with constantly falling leaves, shedding bark and seed pods. Still, I like the tree, maybe because I don't have to live with its' bad habits. I think it is often a very attractive tree and a grove of Eucalyptus can be quite picturesque. Riding through a section of trees, with their particular aroma filling the air, is a very pleasant experience. After 49.99 miles, I arrive in Eureka and find a motel to dry out. Today was a rest day in Eureka. I spent the time among the many shops in the old, Victorian section of town. I feel much rested and ready to start again, although I can't shake a feeling of homesickness and find the Greyhound Bus station down the road terribly tempting. I stayed the night in the Burlington Campground - $3 hiker/biker site. 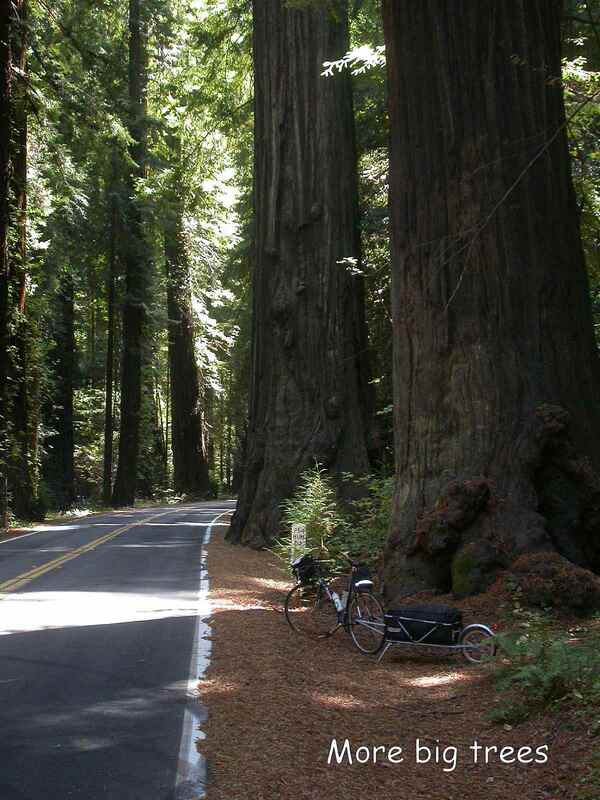 This is 49.04 miles from Eureka and along the "Avenue of Giants", part of the park system that preserves the remaining 4% of old growth Redwood trees. Another Hiker/biker site, only $2 here, in Standish-Hinckey State Park, about 2 miles north of Leggett. It is here where I must make a big decision concerning my route. The coastal route crosses over the mountains to Highway 1. This is a hilly, curving road with little or no shoulders. It is the scenic route and will be cool and windy. The other option is to stay on Highway 101, which goes inland, a drier, warmer route. There would be more traffic but usually broad shoulders. It might also be about 45 miles shorter. One problem with this route would be the shortage of State Parks, at least according to my map. Not being able to make up my mind, I go to sleep. 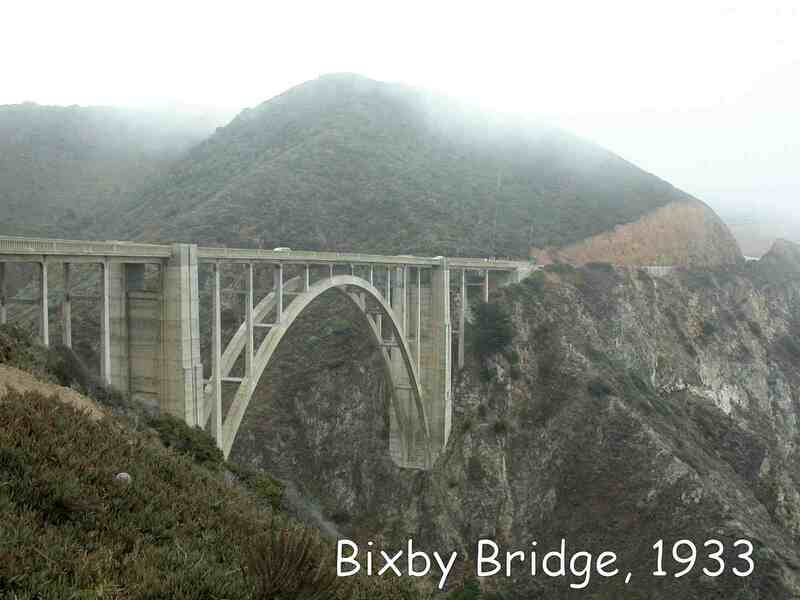 Having heard a weather forecast for rain on the coast, I chose the inland route, down Highway 101 to San Francisco. Still in Redwood country, I must exhibit the same strength of character I relied on in southern Oregon. Every little town, every crossroad, has souvenirs of redwood. Many chainsaw carved bears, Indian figures, and my favorite, replicas of redwood trees cut from redwood trees. In Oregon I had to fight the same temptations offered by Mytlewood souvenirs; salt and pepper shakers, clocks on Mytlewood slabs and many other wondrous things. Of particular appeal were table lamps modeled after some of the many lighthouses along the coast. I rode 49.18 miles to Willits, where I found a motel, some 611 miles from Astoria. The route was through mountainous terrain. Uphill, downhill, uphill, downhill, getting soaked with perspiration going uphill and approaching hypothermia on the downhill. I did a laundry and had a gourmet meal at Burger King. Returning to my room, I watched the National news, seeing the devastation of the hurricane Ivan and reports on the continuing insanity of the Iraq war. 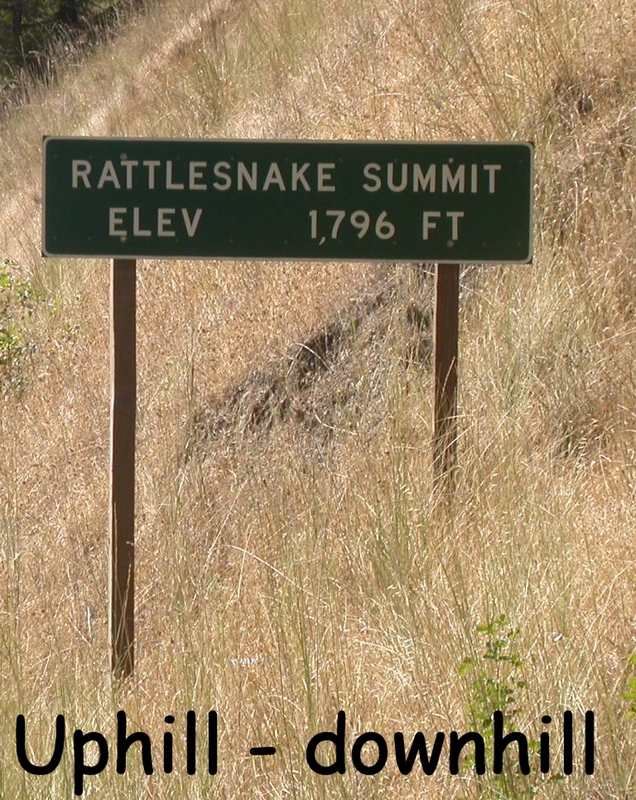 Shortly after leaving Willits in the morning, the road climbed to yet another summit at 1,953 feet. This took a while, but then the road descended for almost 10 miles, and that was good. I followed the road to Ukia, where, during a healthful break of Mountain Dew and a candy bar, I noticed a large staple in my rear tire. Although it did not cause a flat, having a large cut in the tire made me nervous. I found a bike shop where I purchased a new tire from a friendly owner. He described to me and gave me a map of a road that paralleled 101 and avoided all the traffic. It was a great route, passing through quiet farms and vineyards. It was a pleasant day, warm and with the wind at my back. I rode 60.16 miles and made camp at a KOA, high on a ridge with a nice view of the Russian River Valley and the promise of an ice cream social later in the evening. 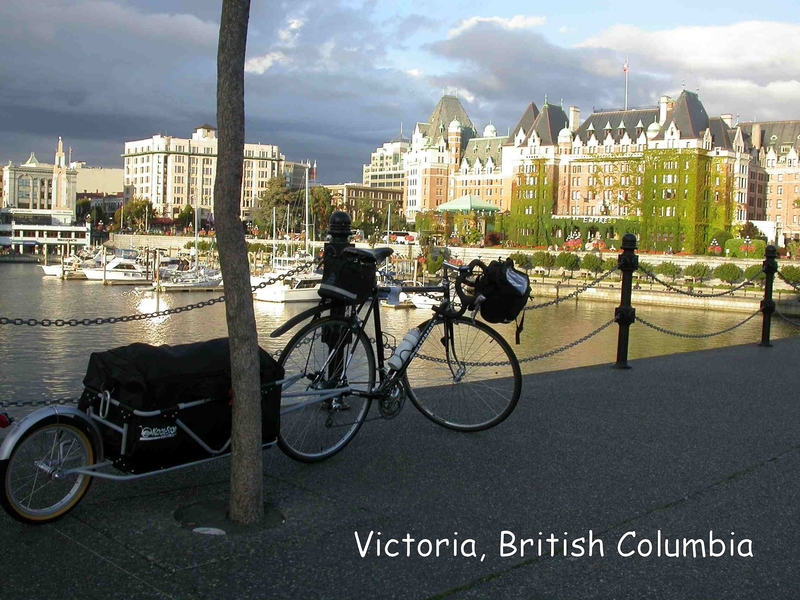 I have seen a few bicyclists on this trip, There was a man and woman couple from Vancouver BC, heading to Mexico, doing the classic Pacific Coast route. 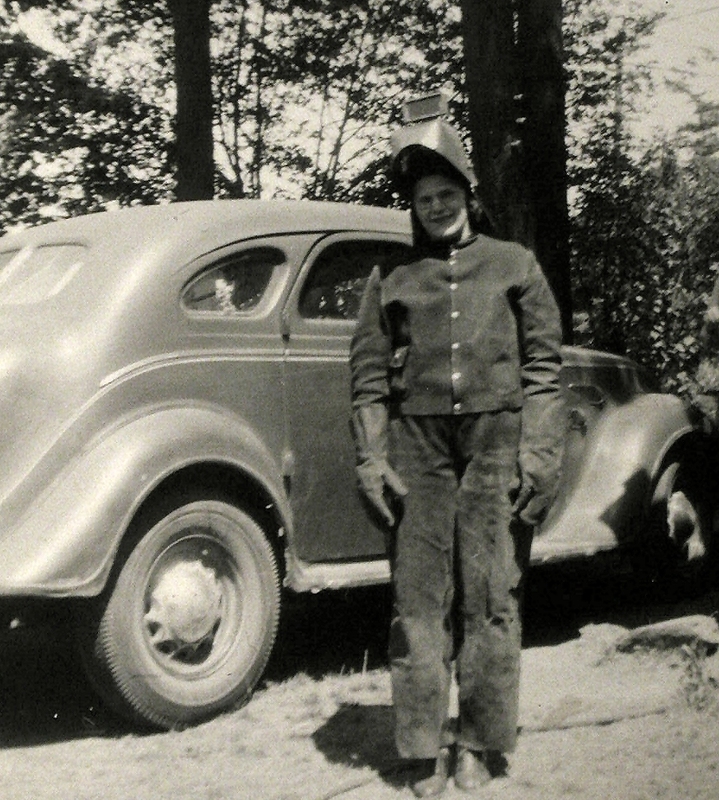 A man who was pulling a trailer to San Francisco. A single woman headed to LA. I met one guy in Oregon from Perth, Australia, riding a lightweight bike with only a small pack on his back. He was heading to San Francisco and planning on staying in motels all the way. He was moving fast and the only way we even had a conversation was at a stop for road construction. I have seen a few others, but none to talk to. In spite of a perfectly clear evening at the KOA, later in the night it began to rain. 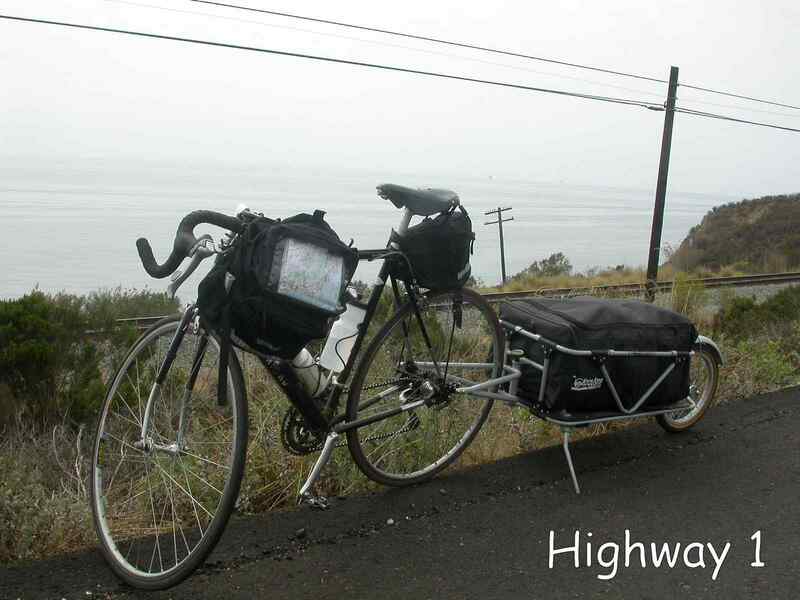 I started out under cloudy skies, continuing down Highway 101. About 20 miles down the road, I was pulled over by a highway policeman. He informed me that bicycles are not allowed on California freeways. (Not totally accurate, as I later found out.) My explanation of how I had been riding on this highway for several hundred miles resulted only in a rather brusque order to get off at the next exit. By using side roads, more or less paralleling 101, and asking directions of several people, I reached Petaluma. After riding for 46.45 miles through intermittent showers and rough back roads, I bailed out for a motel. More questions yielded no legal roads to San Francisco, only 30 miles away. My decision to take the inland route seems to have been a mistake. Asking questions is always interesting, if not frustrating. People, used to driving cars, always have a different perspective. If someone says the distance is about a half a mile, it's usually more like one and a half miles, 5 miles is more like 10, and gentle rolling hills are often enough to bring tears. My favorite is people who express a distance in time, like it's only about 30 minutes down the road. This I have to translate into about a half a day riding. I've had people give me this kind of advice even while I'm standing there holding my bike. From Petaluma to San Francisco, the distance is, the sign says, 32 miles. 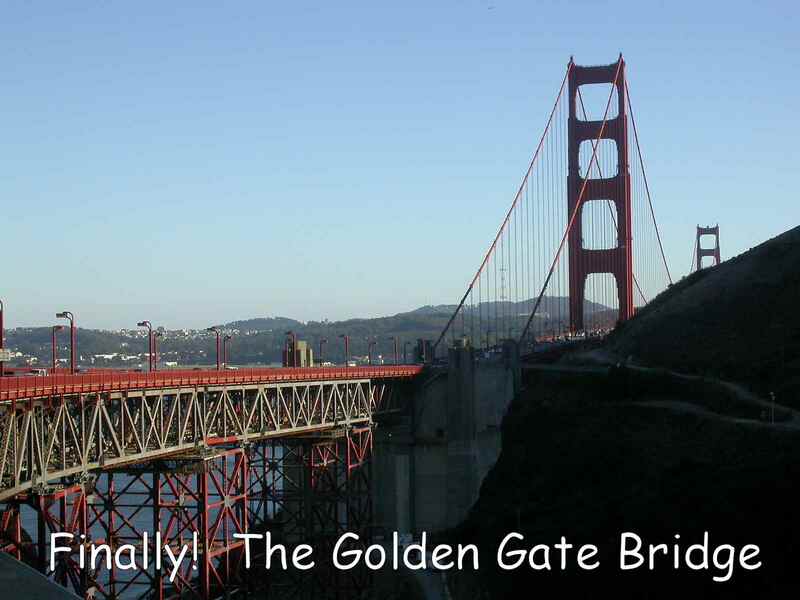 But, I can find only one way to get there without using the freeway, and that is to get onto Highway 1. Unfortunately, this requires me to ride 64.13 miles to San Francisco over some of the most unrelenting, steep hills I have yet encountered. But the weather is great and the countryside is classic Central California. Finally, I'm on Highway 1. The sun had already set by the time I found the inexpensive (relatively speaking) motel I had chosen from the Visitors Discount Coupon magazine. It sounded good, advertising street cars right outside the door. What the ad failed to mention was that the street cars rattled the room every time it went by and it went by frequently. I need a break day and my plan is to stay in this poor motel two nights, spending one day sightseeing in San Francisco. Zero miles pedaled today. Rested and played tourist in San Francisco. The Embarcadero was as touristy and fun as always. I took a city tour bus that gave a good overall impression of the city. It was a beautiful, warm day and apparently unusually clear as the driver/guide kept remarking on all the distant sights that could be seen. 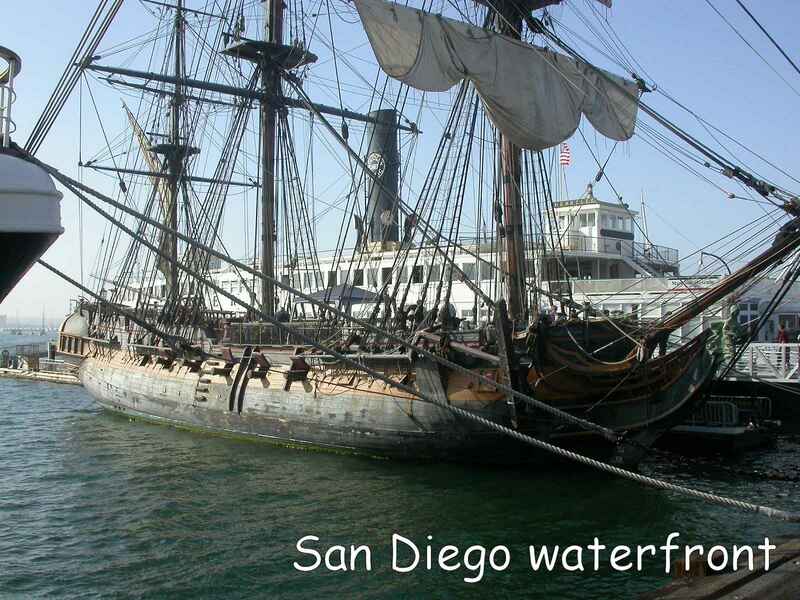 Being a famous sea port, San Francisco has many interesting ships and boats to see and tour. The one that most interested me was an old Liberty Ship. Apparently, this is one of only two still remaining of the many thousands built during WW II. These old ship have a particular meaning to me, as I remember my mother working as a welder on these famous and important ships. I was just old enough to remember the war years and the small farm we lived on with a cow and chickens. 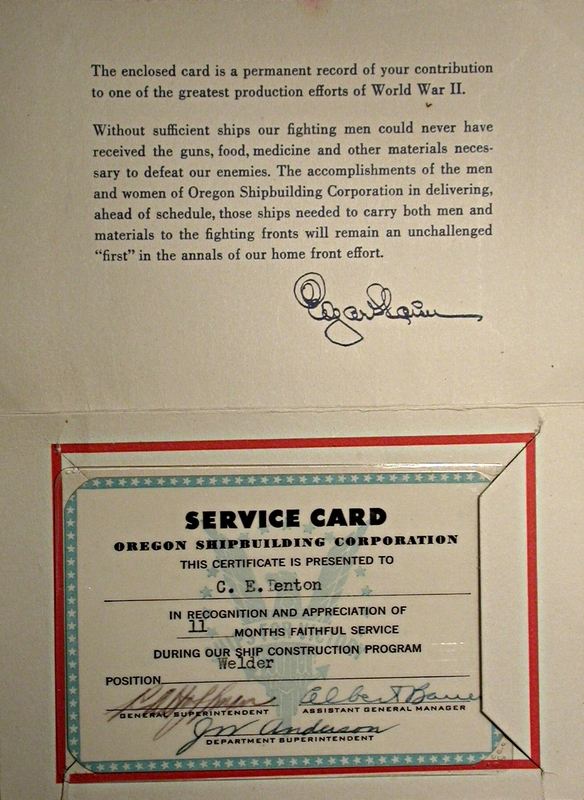 My mother worked in the shipyards and my father was in the Army fighting in the Pacific Islands. Life was quite different then. Left San Francisco and continued down the coast, on Highway 1, for only 34.03 miles to Half Moon State Beach. 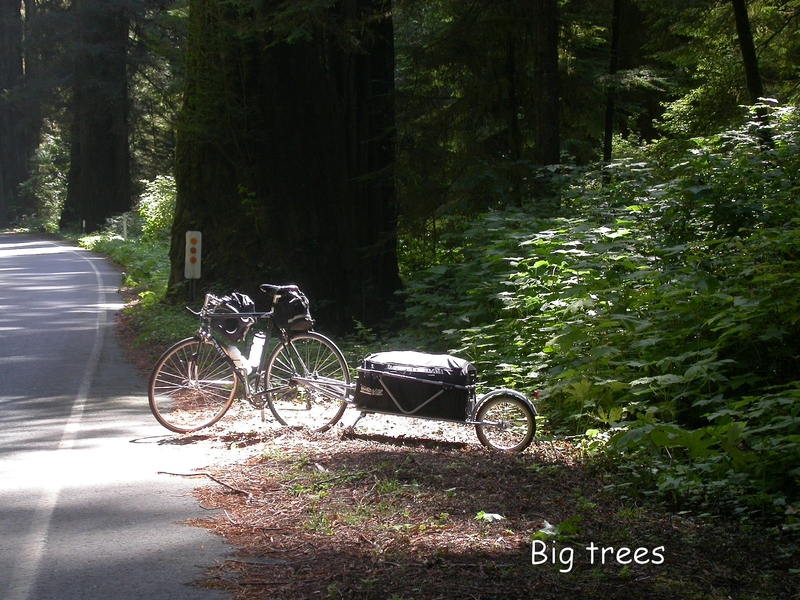 I have been only generally following a guide book entitled "Bicycling the Pacific Coast". 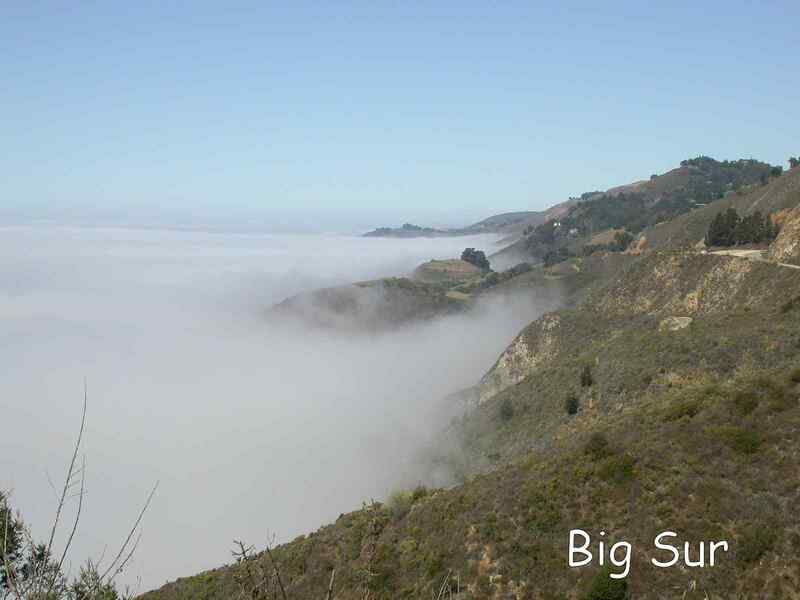 There have been several deviations from their day by day, mile by mile plan, but from here, at least through the Big Sur area, I need to follow the guide closely or find myself without a campsite. Half Moon State Beach is a nice camp, warm and sunny with good showers, always a pleasure after a days ride. It is right on the beach, hence the name, and I can hear the waves crashing and the rather mournful sound of a fog horn. I saw a Burger King about a half mile from the park entrance where I might find something for dinner. It is also the 22nd of September, the Autumnal Equinox, that time of the year when the sun passes right over the equator and the days and nights are of equal length all over the world. It is also the first day of autumn, but hey, I'm in California, it's always summer here, right? The evening started warm and clear, but sometime during the night the fog rolled in. It became surprisingly cold and even lying in my sleeping bag, fully clothed, I slept poorly. The early part of the day was cool and foggy. 53.24 hilly miles down the road I reached Santa Cruz. I was tired and opted for a motel rather than continue another 8 miles to a campground. I hope I'll feel stronger tomorrow as I head for Monterey. 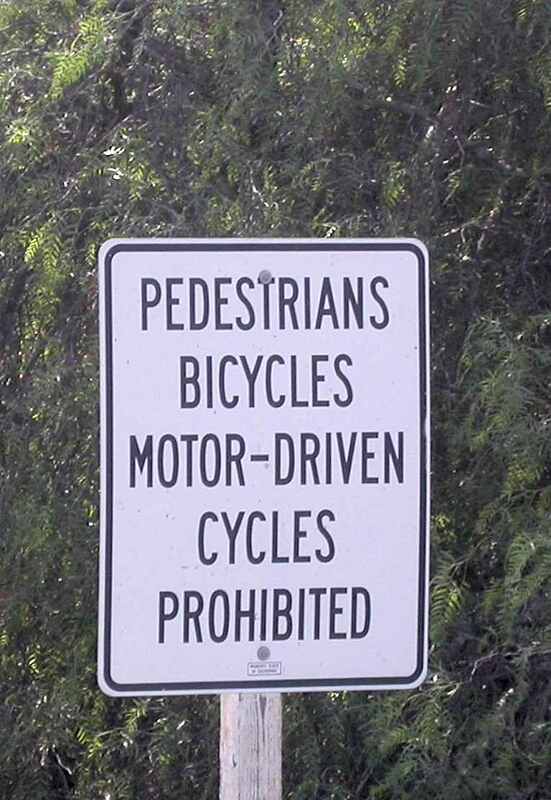 Not letting bicyclist ride on the freeways is obviously a law devised by someone who had never ridden a bike. Granted, on freeways traffic is fast and often heavy, but there is always a generous shoulder to ride on. If you can mentally shut out the noise, they are usually the shortest route. The alternative is to use side streets and parallel roads. These have all been laid out and marked as the Pacific Bike Route, but they are often difficult and confusing to follow, with roads frequently with little or no shoulder and heavy traffic. Not nearly as safe as riding on a freeway. Of the 51.62 miles I rode today, only 8 miles was on Highway 1. A lot of today's ride was through vast farmlands, worked by Mexican farm workers. Many of these workers are, we're being told, illegal immigrants. To me, illegal means unlawful, against the law, and I wonder, if so, why aren't they sent back to where they came from. But, if we need them, and I believe we do, why aren't they somehow made legal, if for only a specified period of time? I heard there was a measure here in California that would allow illegal immigrants to obtain a drivers license. I don't understand how it would be possible to give a legal document to an illegal person. Obviously, there is much I don't understand about this situation. 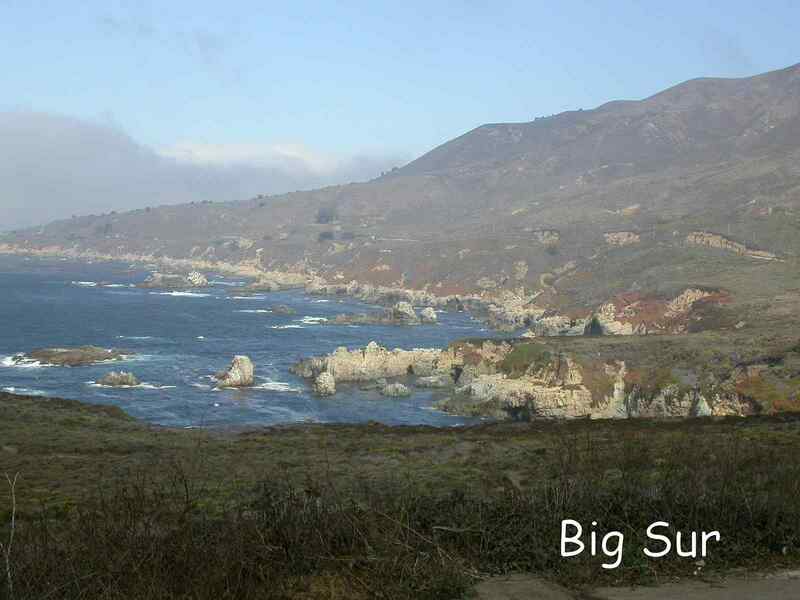 The guide book I'm more or less following, shows the Big Sur area as a 60 mile ride with the possibility of dividing it in half. 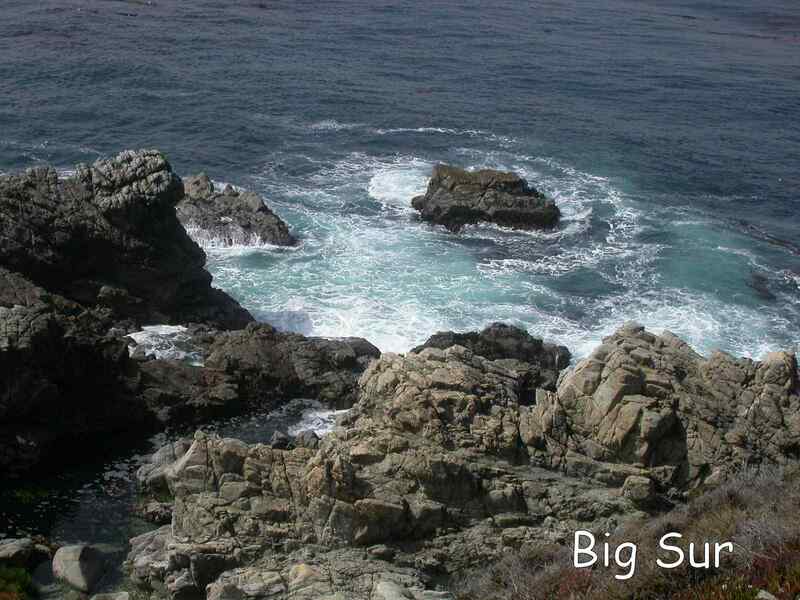 The Big Sur has to be one of the more romantic drives in the country, a wild area with spectacular views and one I've enjoyed driving in the past. Today, though, was not a great day for riding a bike. The road was unrelenting in its' uphill and downhills. The shoulder often completely missing when most needed - uphill and a blind curve, and the weather was cold and foggy most of the way. Gusts of wind would push me all over the road. You know it's windy when you have to pedal downhill! 33.09 miles of this was plenty for one day and I found camp at Pfeiffer-Big Sur State Park. The camp ground was great. Situated a little inland, it was warm and sunny. A nice hot shower and I'm feeling much better. Last fall Corrine and I purchased 3 season tickets to the Oregon Symphony. The idea was that at each performance we would take a granddaughter, exposing them to a little culture and all that. Tonight is the first performance and I obviously won't be there. Corrine is taking our daughter, Stephanie and Blake, the youngest of the Oregon set of granddaughters. The performance consists of Beethoven's 6th symphony and Stravinsky's Rites of Spring. Beethoven will be easy enough to hear, but Stravinsky is a bit hard for a new listener. I'm curious as to the reactions. Only 26.44 miles today, the shortest day so far, but it might be one of the hardest. The weather remains cold with blustery winds and fog. I don't even get to appreciate the many view points that are usually found after a long climb. The fog does break occasionally, giving a tantalizing glimpses of this beautiful area. I stopped at the Limekiln Campground for the evening. 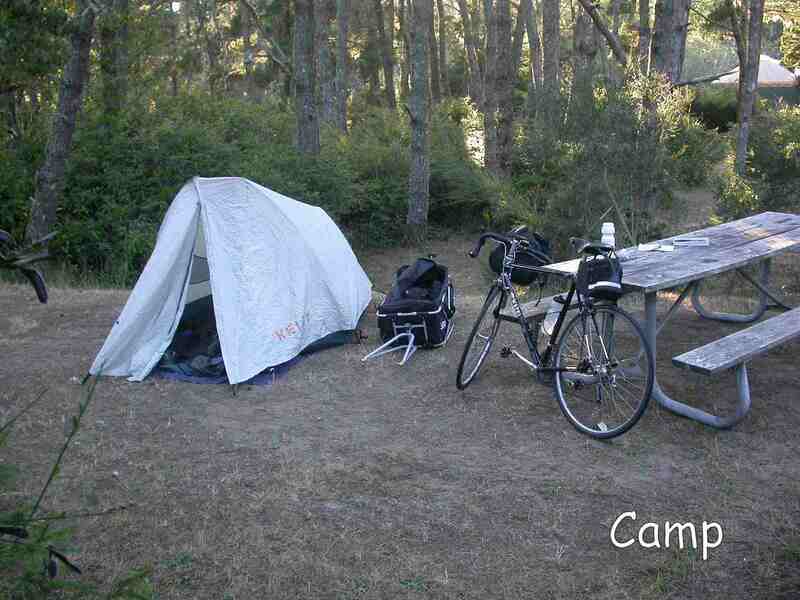 The next known camp in San Simeon, 40 miles further over much the same kind of road. Although the miles today was short, I wasn't in the mood for another 40 miles. The camp is right on the coast, and so was rather cool and foggy. 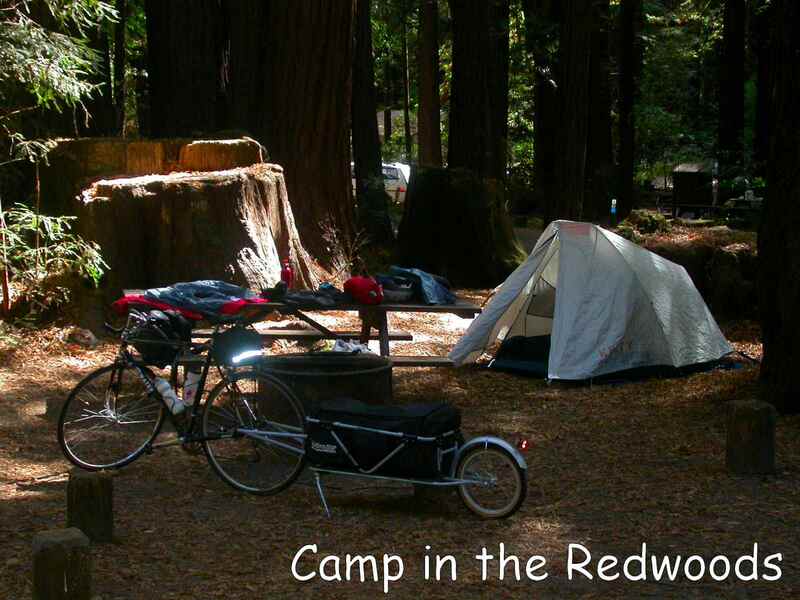 It would be a nice camp on a warm, sunny day, situated in redwood trees. My guide book suggests that once at San Simeon, it is considered to be Southern California. I'm ready for more warmth and maybe a few less hills. 40.74 miles finally got me out of the Big Sur. It remained foggy and cold in the hills and didn't clear until approaching the rolling flat lands just before San Simeon. I checked into a motel in the town of San Simeon with the idea of having a rest day as I was feeling a little weary. There's laundry to do and maybe a trip to the Hearst Castle tomorrow. This stretch of coast in very lightly populated, and would be nearly zero if it were not for the small group of motels, inns and restaurants catering to visitors of the castle. I'm reminded of something I recently read by Reinhold Messnier, surely one of the greatest mountaineers of the 20th century - "We have come a long way, we have a long way to go. In between we are somewhere." 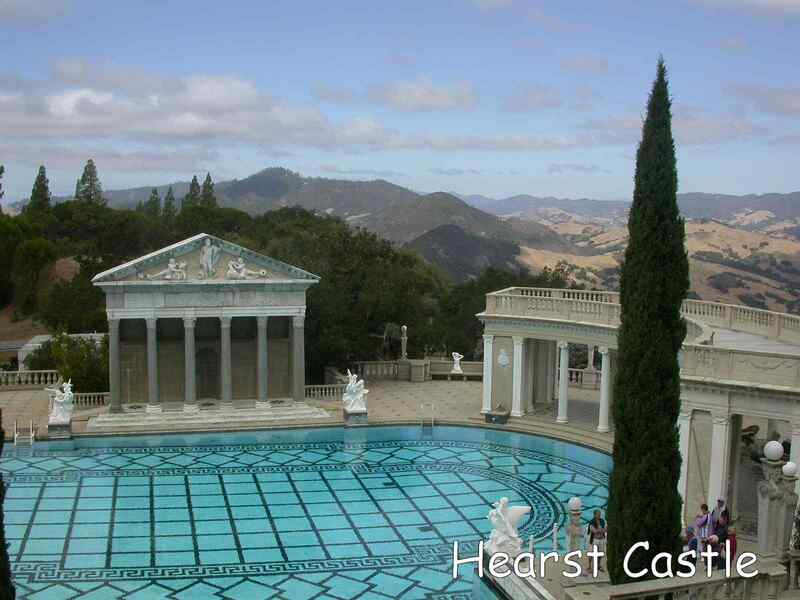 Today is a rest and recreation day and I rode only 9.36 miles which was back to the Hearst Castle. The castle, under the control of the California State Park Commission is quite interesting. You might look at it, perched high on a hill, as an awesome collection of art and artifacts, housed in impressive architecture in a spectacular setting. Or, you can see an ostentatious display of second class art in a setting of achitecture with no historical continuity. You decide. There was a 6.0 earthquake while visiting the castle, which nobody felt. "Biggest quake in 30 years", the local paper exclaimed. This is day 27 of my weight loss program. I don't think it's working very well. I'm burning a bunch of calories every day, but I don't seem to be losing weight. Must have something to do with my eating habits; fast foods, milkshakes, high carb foods, definitely not Atkins friendly. The speed that I travel varies considerably. On a good road, flat and with no wind, I travel about 14 miles per hour. With the wind at my back, the speed increase to about 17/18 MPH. If there is a head wind, it might drop to 9/10 MPH. Hills are are something else. In my lowest gear ( the bike has 27 speeds and it's still not enough! ), I might make 4 MPH uphill. Downhill speed depends a lot on the condition of the road, usually around 25/30. On one particularly good road, I briefly saw 40 MPH. Then there was one, altogether too short, stretch where everything was right; smooth, flat road, strong tailwind, where I found myself cruising at 21/22 MPH. Continuing down the coast, I go past Morro Bay, San Luis Orbispo and on to Pismo Beach for a day of 56.85 miles. Still under the weather with the cold I somehow caught. I rode only 46.90 miles over a big mountain, putting me in Lompoc and a Motel 6. I've seen a lot of motorcyclist on this journey, many obviously touring with bags tied on or, even pulling small trailers. What I find interesting is that occasionally, a rider will wave at me as if the kinship of traveling on two wheels is greater than the gulf between motorized and not. The weather for the last couple of weeks has not been as warm as I had hoped. The day time high has only been in the mid 60's and drops well into the 50's at night. Most days have begun completely overcast with the sun not coming out until around 3:00. I prefer it a little warmer and it's surprising how sunshine lifts your spirits. From Lompac, I rode down the Santa Ynez Valley route to Buellton. From there highway 101 (not a freeway here) took me back to the coast and through Santa Barbara to Carpinteria State Beach and a hiker/biker site for a total of 81.37 miles. This is a nice campground and one that Corrine and I have stayed at on one of our trips south. Carpinteria is the name of a florific hedge that is common in this area. 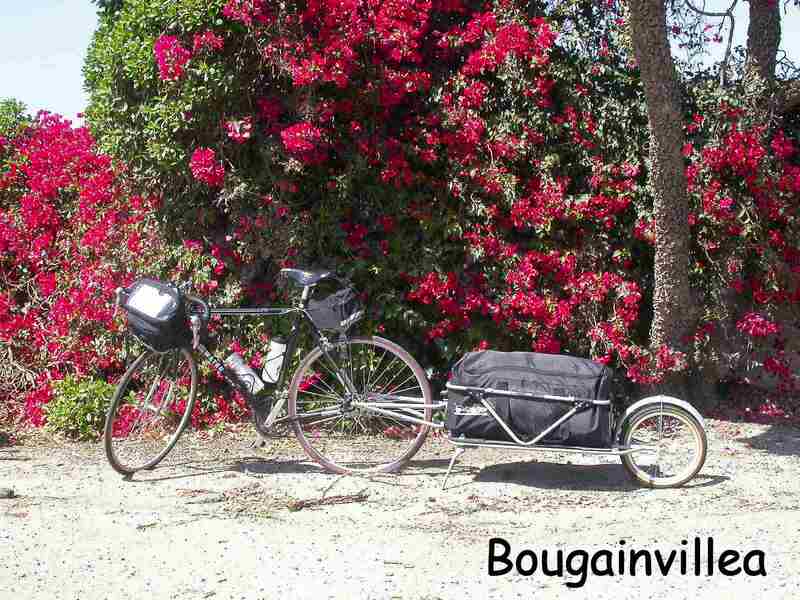 Bougainvillea is also common here, growing in wild, colorful hedges. Talked with a German bicyclist in camp. He rode from Phoenix, up to Jasper/Banff and back down the coast. He was planning to return home from Los Angeles and had been riding for four months. Kind of puts my ride in perspective. The population and traffic increases dramatically in Southern California. Malibou, Venice Beach, Santa Monica are just some of the towns along Highway 1. 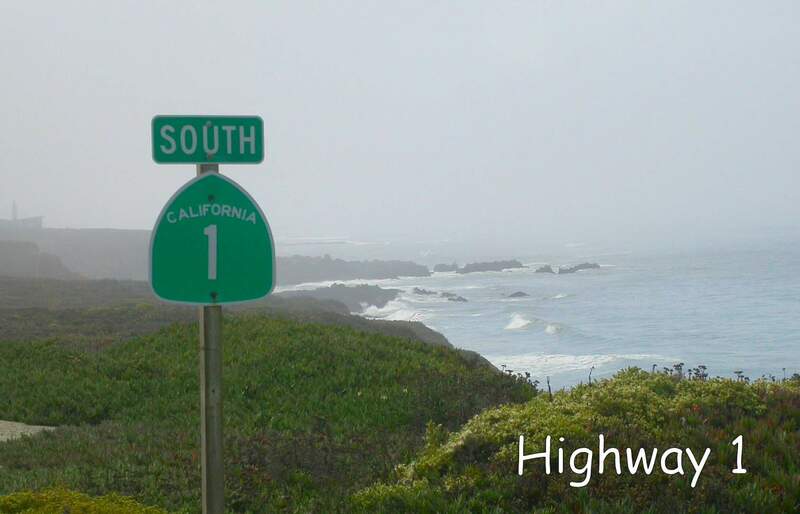 Highway 1 is now known as Pacific Coast Highway, or PCH as it is referred to here. I rode 83.58 miles and ended up at my son's home in Rancho Palos Verde. I spent two days at Brad's and Kristine's and my two California-based Granddaughters, Madison and Zoe. The visit was good, the rest was good, and staying longer was very tempting, but I was eager to finish the ride and return home. This stretch of road has been almost all urban riding which is extremely slow. The heavy traffic, stoplights and signs and the total concentration is both tiring and slow. I rode 53.18 miles to San Diego and found a motel near the waterfront and the Amtrak station. There are many freeways into San Diego, but, of course I can't use them, instead, I got thoroughly lost in the residential area. I hate getting lost, mostly because it requires me to do that which a man avoids at all cost - asking directions. The real problem with asking directions, aside from having to admit to a certain weakness of character, is that most people either can't answer your question, or give wrong or inaccurate directions. I usually try to ask several people the same question, hoping to get two that say the same thing. Tomorrow for sure, Mexico, and the end of a long trip. I should have a little time for sightseeing, too. MEXICO !!!! After 19.55 miles of real hard-core urban cycling from San Diego, I finally reached the border. 19.55 miles -the shortest day of my longest ride. I even managed to talk an airport van driver to drive me back to San Diego. I went to the Amtrak station and got my bike and trailer all checked in for tomorrow's train. It was still early in the day and I spent it among the many interesting places along the waterfront and took a city tour. Tomorrow, I catch my train at 6:15 in the morning and will be in Portland 34 hours later. "There is something uncanny in the noiseless rush of the cyclist, as he comes into view, passes by, and disappears."